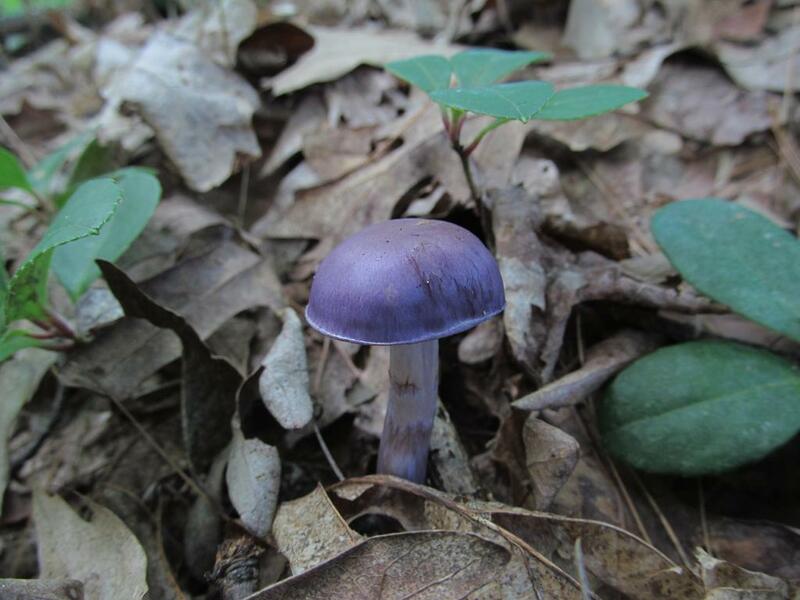 Today I spent a little time in the woods behind my house. Pnny came along in case there were any sticks that needed retrieved. There were. 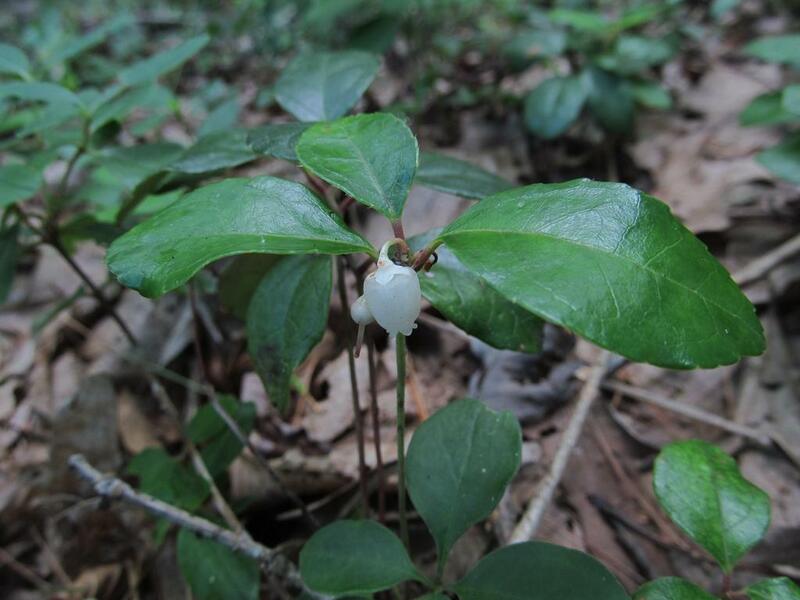 Here is a wintergreen (some call it teaberry, but I prefer to call it wintergreen) in bloom. This stuff is thick at my place, and I like that. 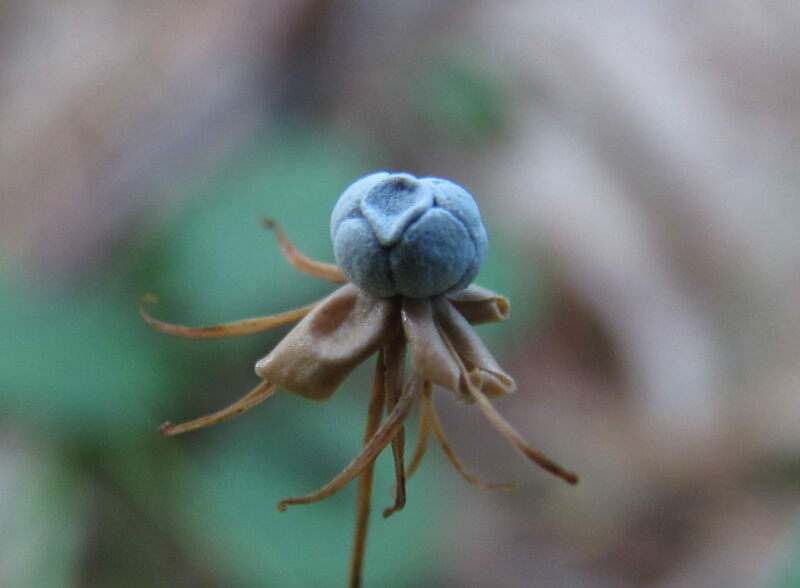 I recognized it immediately as a starflower. They have pretty flowers in the early spring, but I find their fruit even more interesting. This one was only about a 16th of an inch across (which is typical). The shot is cropped, but not not scaled much. I think it looks like a blue soccer ball. 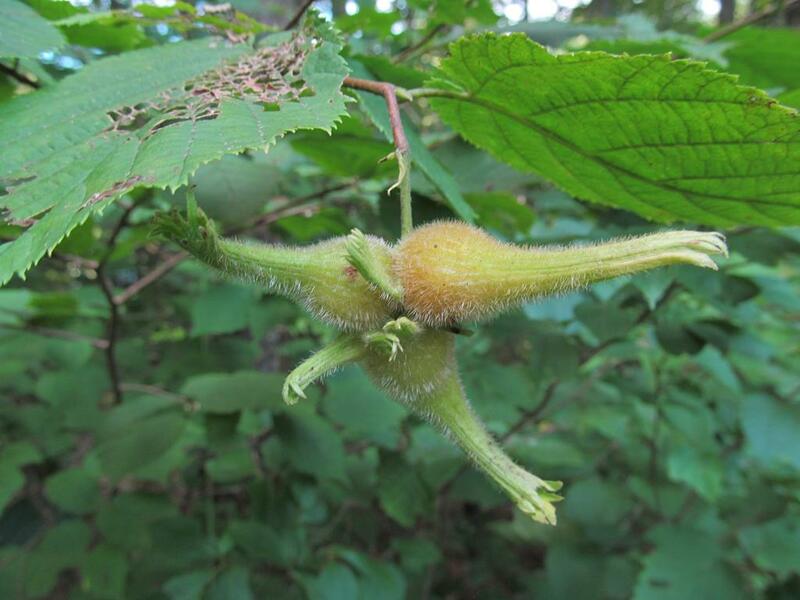 In the front woods I checked out the hazel. Not many nuts on them this year. I have tried harvesting them in the past with little luck. The squirrels and/or chipmunks here tend to harvest them before they get ripe, leaving none for me. The husks are covered with tiny prickers. If you grab one and pull you will be rewarded with a handful of spines. They detach from the husk and are so tiny that makes them nearly impossible to remove from the skin. But if I see a ripe one, I will pick it anyway. If I can ever get them in quantity, I’m sure I could figure out a good way to avoid the prickers. It is the lobelia I see most often, and it’s fairly prolific around the edges of the yard. 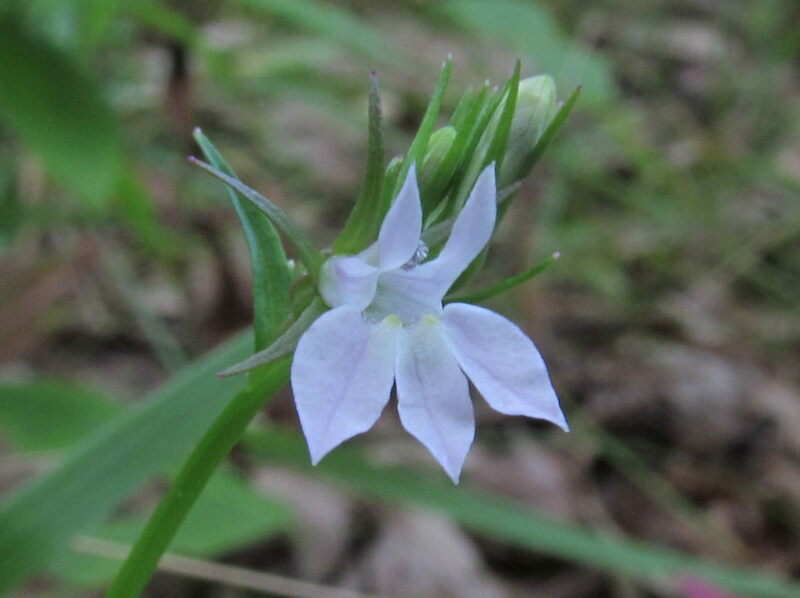 Maybe next week I will go to Sandogardy Pond to look for aquatic lobelia (Lobelia dortmanna). I went into Northfield’s town forest with Penny today. There’s a place at the end of the trail where inconsiderate people like to camp. I do not understand these campers though. They tend to haul in a bunch of gear and then just abandon it. I picked as much of it up as I could in one trip today and hauled it to the trash cans at Sandogardy Pond. I had it in my mind that that’s what I was going to do on the way. I didn’t have a bag or anything, but figured I’d find something bag-like when I got there. And I did, in the form of a pillow case. Here it is after I loaded it to the point where it began to tear. I took a picture with Penny in it for scale. Here’s some of the trash I was not able to take care of. I picked up all the plastic bottles, as they would take an eternity to decompose. I suppose this heated air mattress (who brings one of those camping?) will also never decompose, but it was too big to fit in the pillow case. 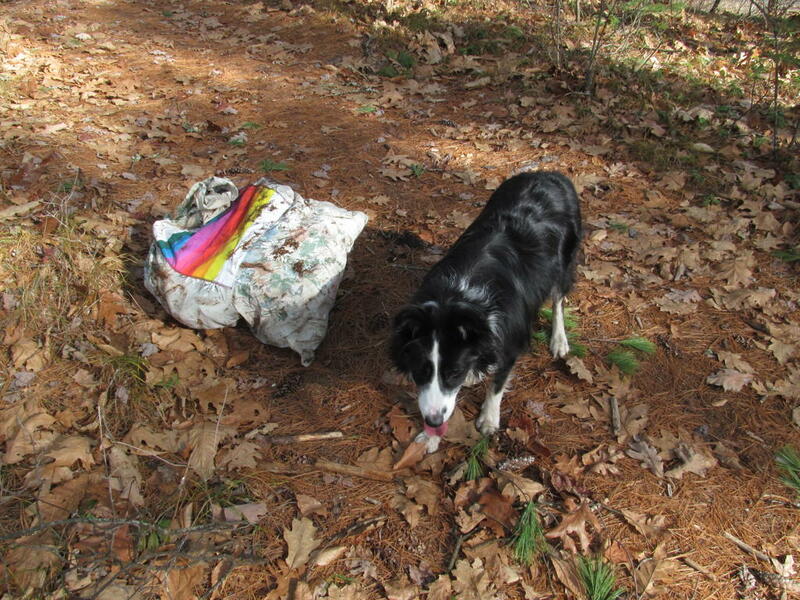 We hiked out again with me carrying the loaded pillow case. I spotted something bright green about 20 yards off the trail. 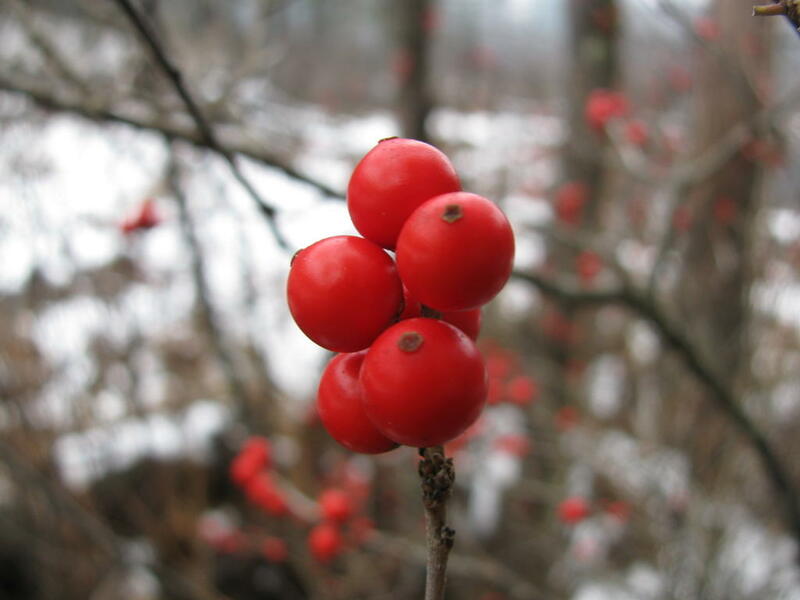 At this time of year, there’s not a lot of bright green out there (save the wintergreen and partridge berry). 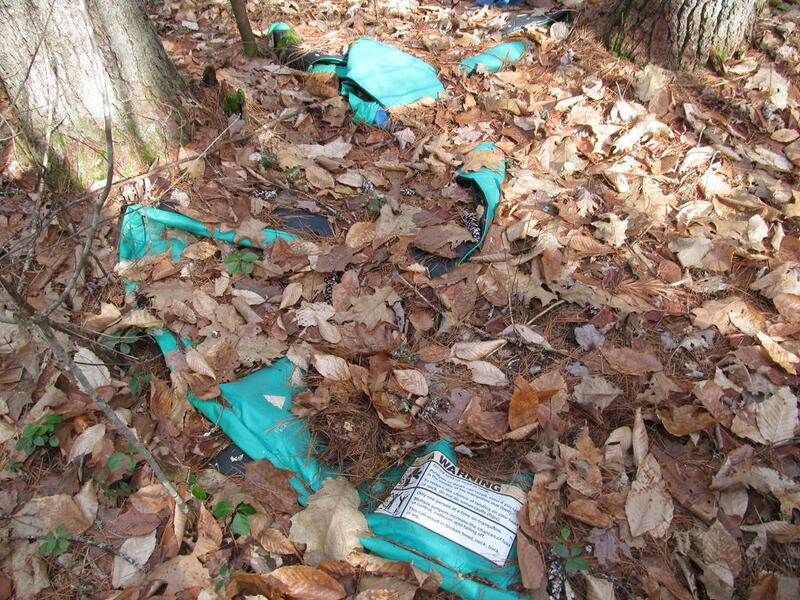 I left the pillow case on the trail and went for a look. I assume someone dragged this out here to dispose of it, but I cannot imagine a reason why. I might have to go back for that. I’ll have to bring the wagon. 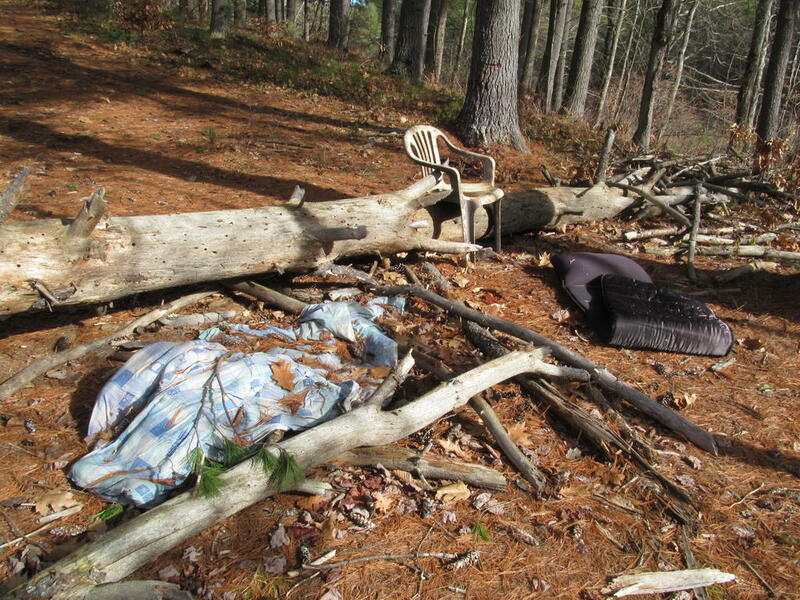 The pond was pretty close, so in no time, the pillow case and its payload were deposited in a trash receptacle. 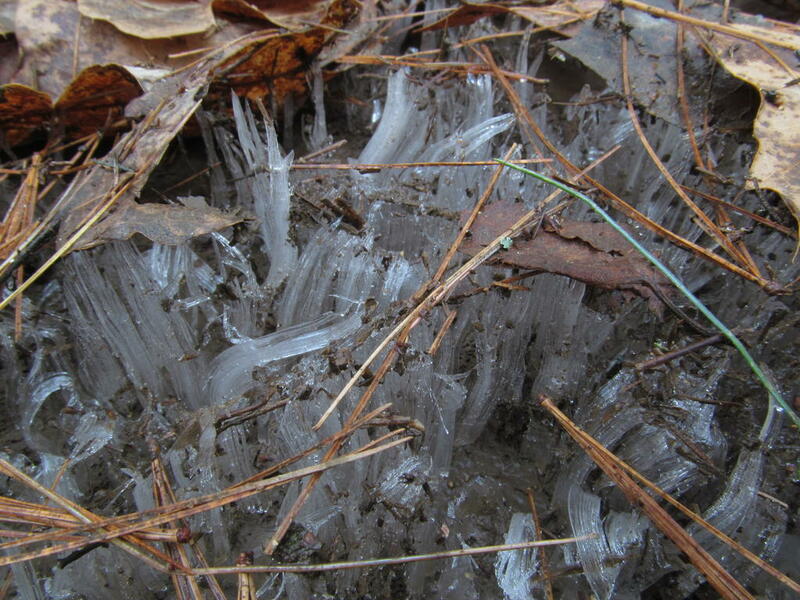 Then Penny and I headed back towards the house when some ice crystals in the path caught my eye. 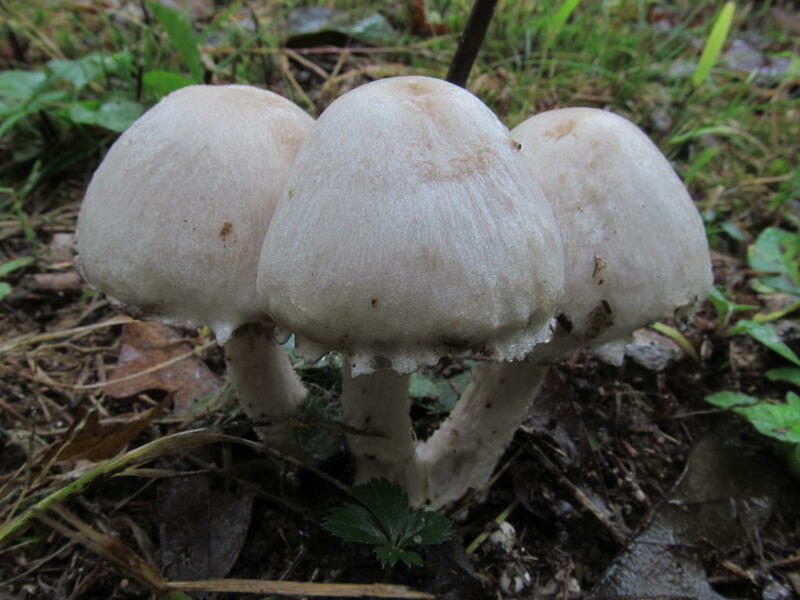 I’ve seen these growing here in the past. I’d like to know how they form some day. 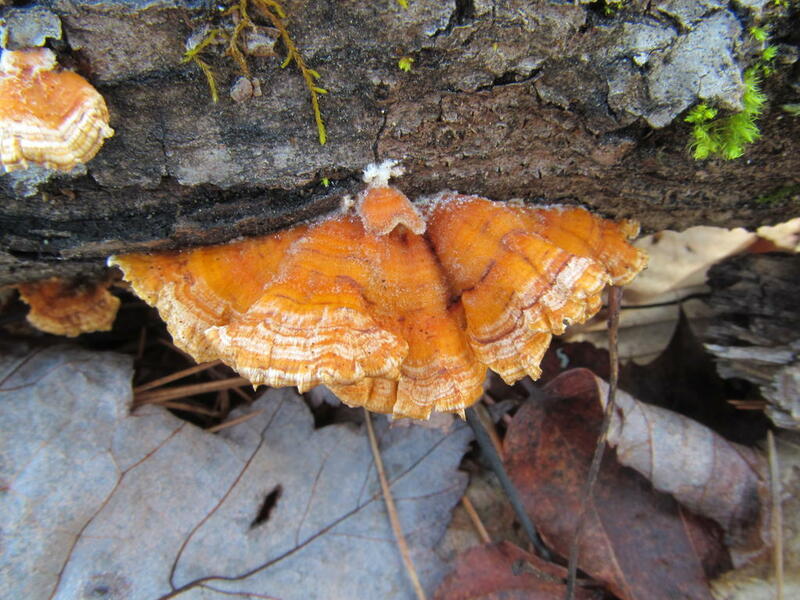 Beyond that, I saw some turkey tail mushrooms (Trametes versicolor) growing on a fallen log. Couldn’t leave my readers with a trash-only post. Yesterday when I got home from work I walked around my trail on my property. A dead tree had fallen on my path. It had been dead for a while, and I had been thinking about cutting it down. Sandy beat me to it. It was free of branches by then, so dragging it off the path was just a matter of some heave-hoeing. 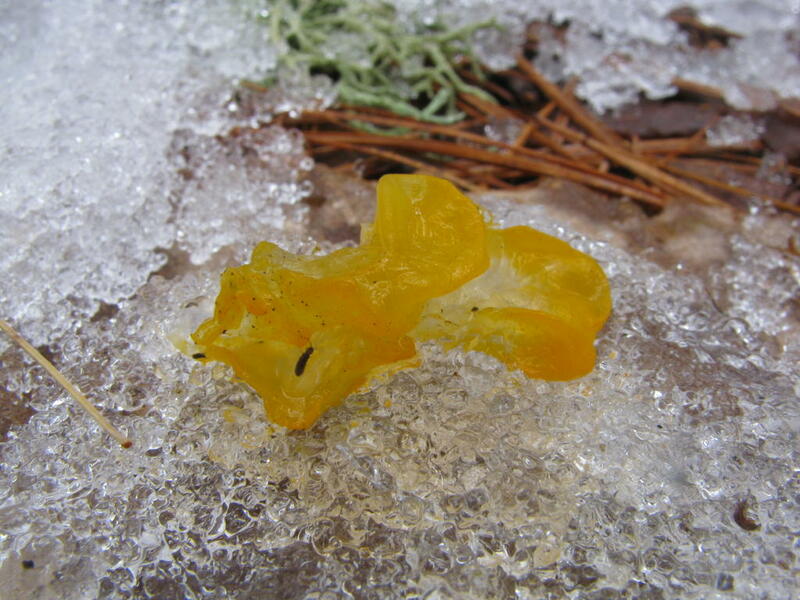 This witches butter was nearly hit by the tree when it fell. A bit farther down the path I found this fungus growing on a small stump. 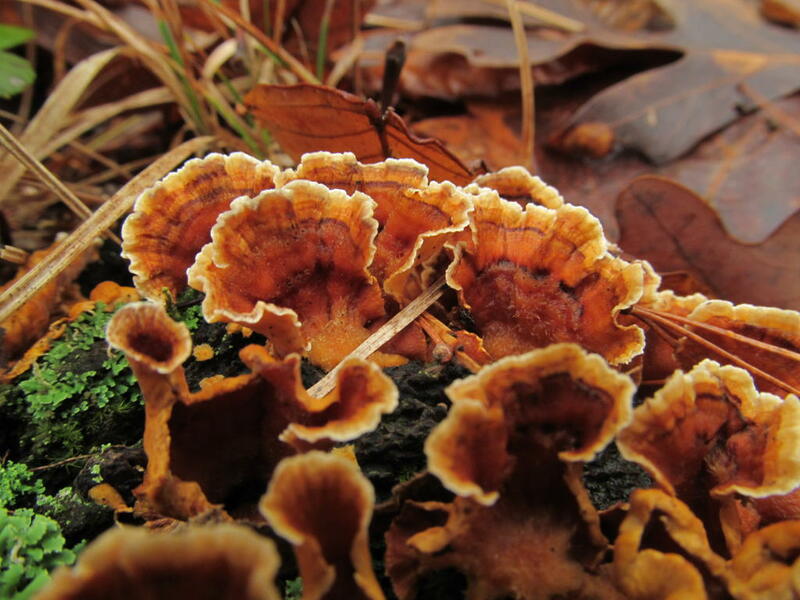 I think it might be turkey tail (Trametes versicolor). That brings us to today. I went for a walk at lunch, and was sure to go by our new still-under-construction office building. We will move in in August. It’s right across the street from where President Franklin Pierce died. I went looking for his house in September but couldn’t find it. I did some more reading and found that there is a marker in the front yard. What I did not know was that the house is no longer there (which is why I had a hard time finding it). 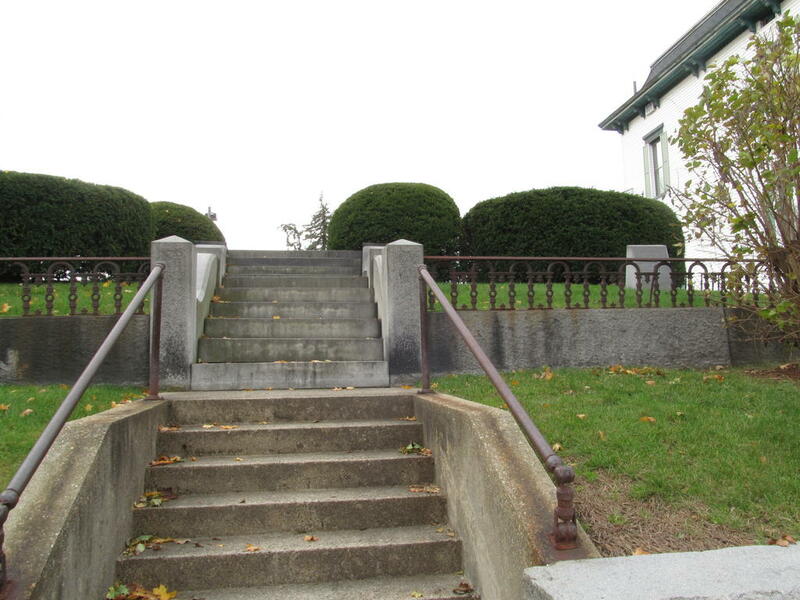 Here are his front steps. 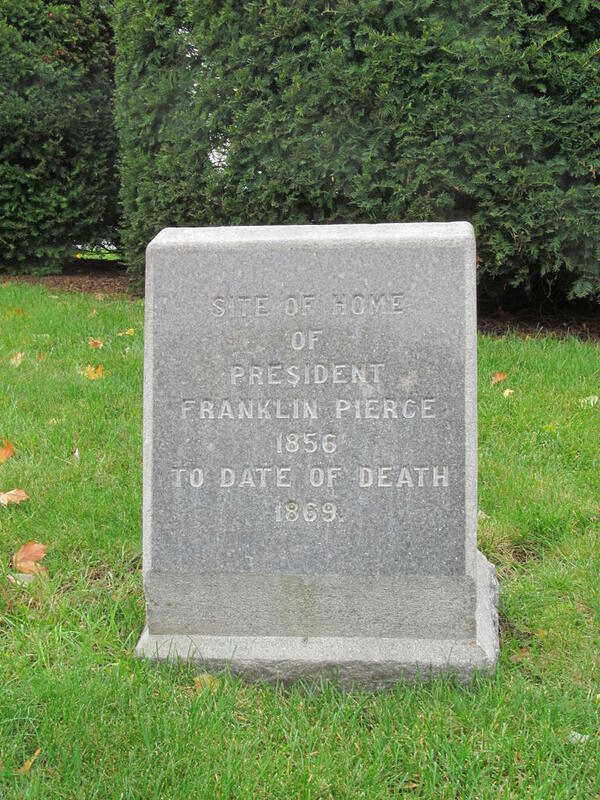 Franklin Pierce was the 12th President of the United States. By some accounts, he was the worst Chief Executive in US history, and many lay at his feet the blame for the Civil War. I don’t know how accurate that is. At any rate, his house is on the National Registry of Historic Places. Except – as you can see from this photo – it no longer exists. Tonight I took a lap around my property just before it got dark. 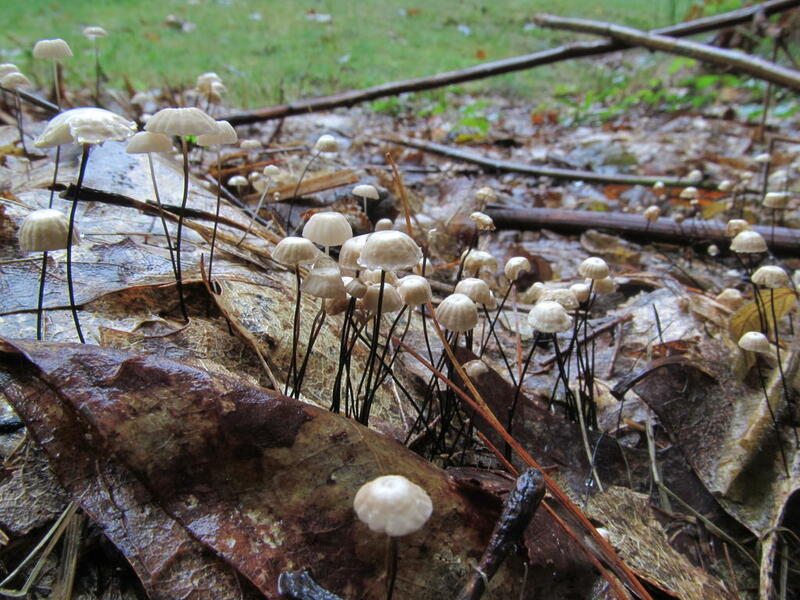 The most interesting thing to photograph was the mushrooms. I asked him to clarify, “With whose arm tied behind his back?” He indicated that it probably didn’t matter, and since he outweighs her by nearly two to one, I think he was probably right. That’s when I learned it was probably not a contest of physical strength. David called out to Beth, “e4” which is chess notation for a very common opening move. She answered him, “e5!” and the game was on. No chess board mind you. The conversation then morphed into us speculating about whether one of us could beat David in chess if he were blindfolded. I was not sure if either of us could beat David, even if he were blindfolded. Beth was excited to try, so out came the board. I watched to make sure Beth executed David’s moves correctly and that she called her moves in proper notation. Beth dropped her queen in short order, and David captured it. I was impressed. After that her only hope was that the board would get so scrambled that David couldn’t remember where all the pieces were. It was a vain hope. He checkmated her in short order. I’m still trying to get my head around that. I spent yesterday and a good portion of today backpacking with some of the Pathfinders in my club. Last month I taught a class on backpacking during Honors Week, but no one can get the patch until they have actually gone backpacking. We checked that box today. When we got to the trailhead, we noticed that Google was there. I had never seen one of these before, and frankly, I was never expecting to. While we were still getting our backpacks out of the cars and paying the use fees to the US Park Service, the Google guys popped out of the forest. They gave some of the kids a partial can of Pringles. I think they were just as excited about having gotten something from the Google guys as they were about getting Pringles. We set out a little after that, and not far up the trail, I found a neat little spot where the trail comes close to the river. We cooked our lunch there, and the kids all seemed to enjoy the stream. David found a perch in the middle of it, and none of the kids could figure out how he got there. Hint – he can jump farther than they can. David relaxing in the middle of the stream. Perhaps two hundred yards upstream from there, the trail crossed the river. We forded it with no issues. David crossed it expertly, but some of the kids were a tad nervous. We hiked up, and up, and up. I guess we went in about 2.5 miles which doesn’t seem like much, but with seven kids in tow (plus four adults), and all of them carrying more gear than they should have, it took a while. My plan was to hike all the way to East Pond. I have been there before, but by approaching it from the south. We were coming in from the north. All the while, I was looking for a suitable place to pitch our tents and spend the night, and that was a tough job. The forest there is loaded with deadfall, and we were hard-pressed to find a place big enough to pitch a tent without it landing on a log. 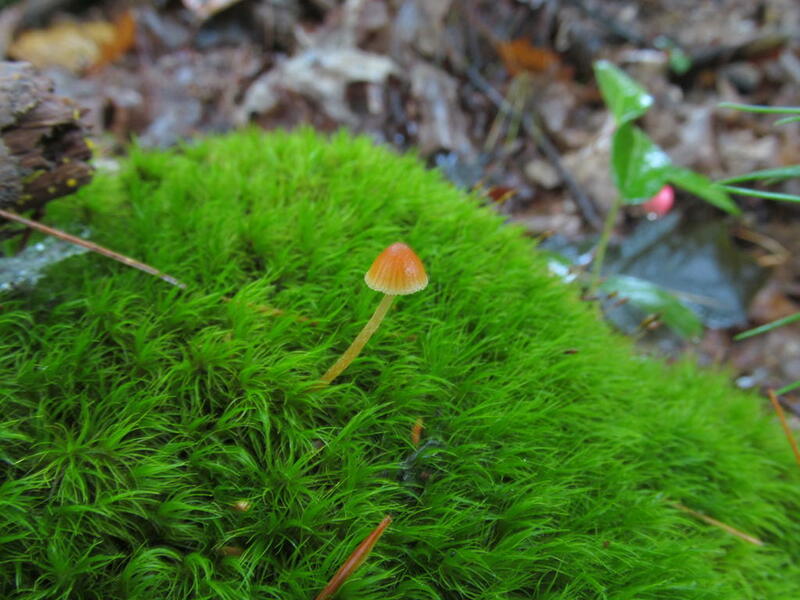 I looked at several places, and then pressed through some really thick hemlock and found a flat, mossy place. It was nice – but I suppose we would have to classify it as a bog. But bog is better than log, so we found the driest places available, pitched our tents, and stowed our sleeping bags in them. 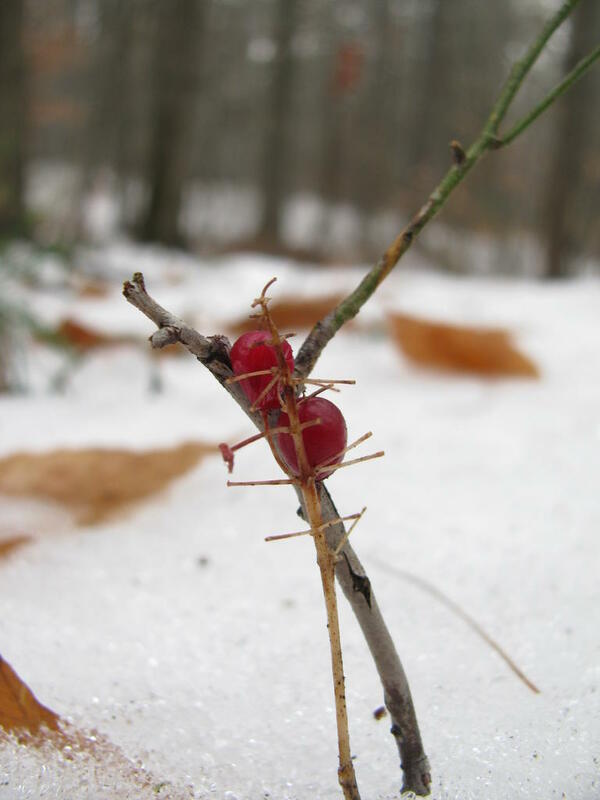 I found some winter berry (Gaultheria hispadula), which I had never seen before. I knew it was in one of my books, but couldn’t recall the name until I looked it up at home. 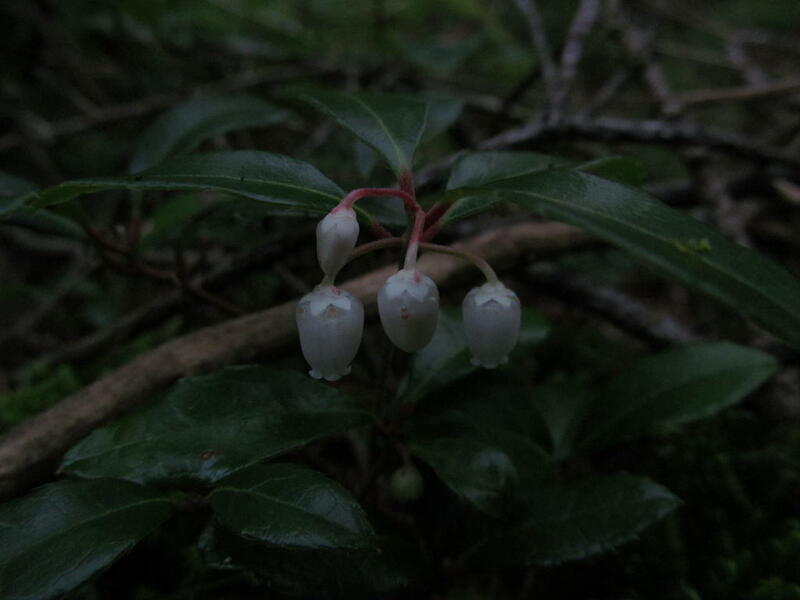 This is in the same genus as wintergreen, and like wintergreen, it is edible. Most white berries are not, and since I didn’t know this plant, I did not sample it. I will next time though. The books say it tastes just like its close cousin. 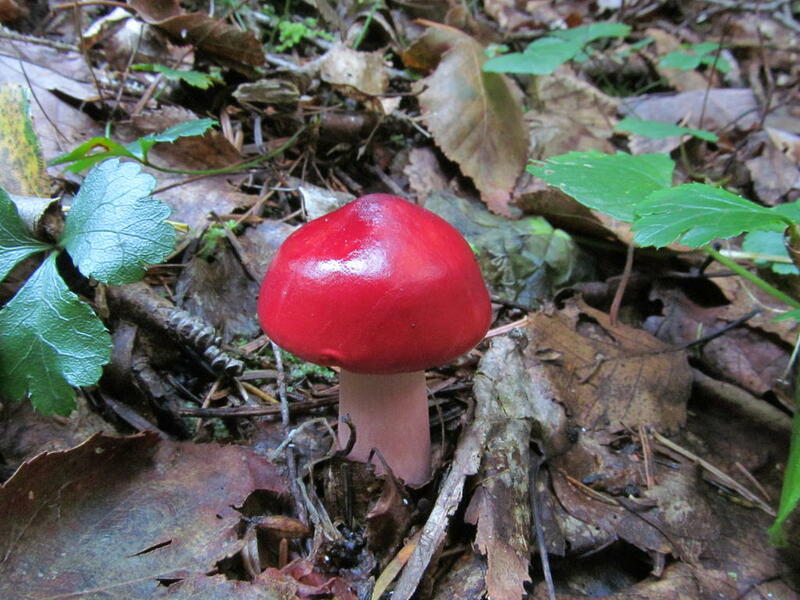 I also found this bright red mushroom. 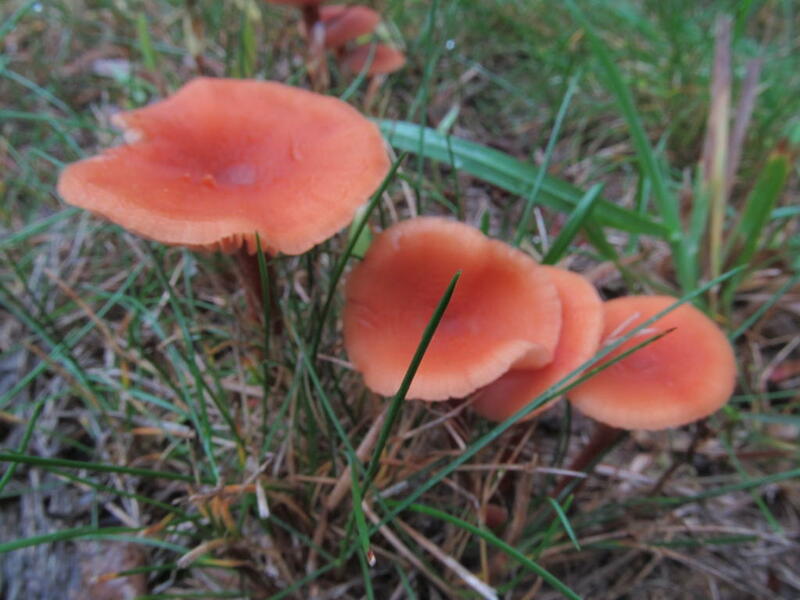 I have no idea what kind of mushroom it is, and I haven’t looked it up yet. I think it looks like one from any Mario Brother’s video games, so I’m just going to go with that for now. This repair was incredibly effective, and I was rather pleased with myself for having made it. I will have to address it on a more permanent basis soon though. With our tents pitched and bags stowed, we continued up the trail unladen (for the most part). We didn’t make it all the way to East Pond as I had hoped. Before we got there, turn-around time arrived, so I turned us around and we went back to camp to begin cooking supper while we still had light. 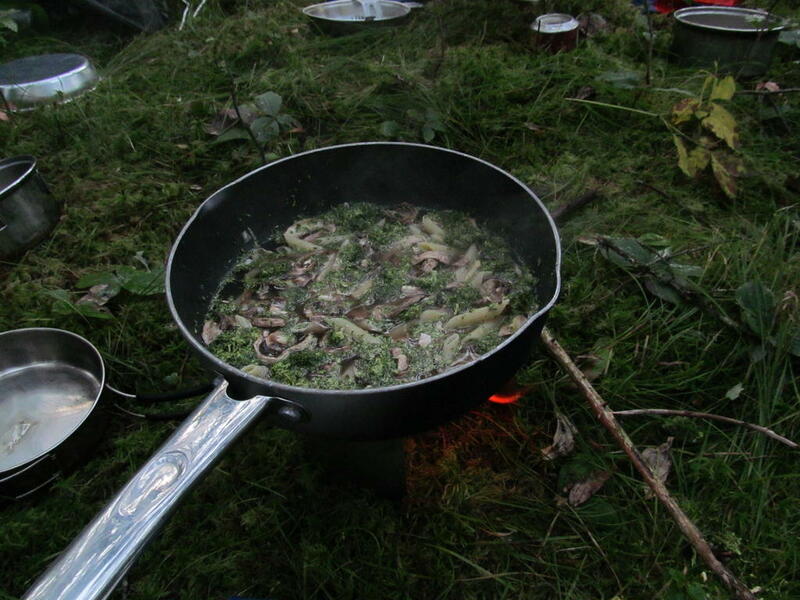 We beat the sun back to our tents and began supper prep. I boiled up a bit of penne pasta with some broccoli, mushrooms, and garlic that I had dehydrated late last week (just in time). Then I tossed in some olive oil. It was very good if I do say so myself. The penny stoves performed pretty well. I did learn of one drawback to using isopropyl alcohol vs denatured alcohol – isopropyl leaves a lot more soot. Everyone (me included) had black all over themselves by the time they were finished handling their pots. It scrubs off the pots easily enough, but I’ve still got it around my fingernails and in my fingerprints. But I think the visible flame (denatured burns with an invisible flame) was well worth the sooty downside. We didn’t build a campfire. That was partly because there was no good place to sit in the bog without getting wet bottoms, and partly because we were trying to engage in “leave no trace” camping. I don’t think we left a trace either, and I’m pretty pleased about that. We turned in around 9:00pm, and I got up around 6:30. I ran into some regular wintergreen in bloom – it quit more than a month ago at my house, but I guess the higher altitude made it bloom later here. Sorry for the darkness of that shot. It was handheld, and I was in a hurry (nature was calling). I would have gotten a better shot if I had taken the time to set up the tripod and lengthen the exposure time, but… I had to go! When all the kids were up, I had them strike the tents and load up again. The plan was to hike back down to where he had eaten lunch the previous day. The bog was nice (really! no bugs, and not nearly as wet as one might imagine) but I wanted to eat in a slightly drier spot. That exercise took about two hours. The tent that I repaired has a somewhat porous floor, so Beth’s “pillow” got wet. She stuffed all her clothing in a pillow case, and that meant that all the clothes she had other than her PJ’s were very damp. So she hiked out in her jams. The stream was just as nice for breakfast as it had been for dinner. I had pancakes (as did several of the kids). Others had oatmeal, and some had dry cereal. We loaded up again at 11:30 (it was a late breakfast) and in thirty more minutes found ourselves at the cars. 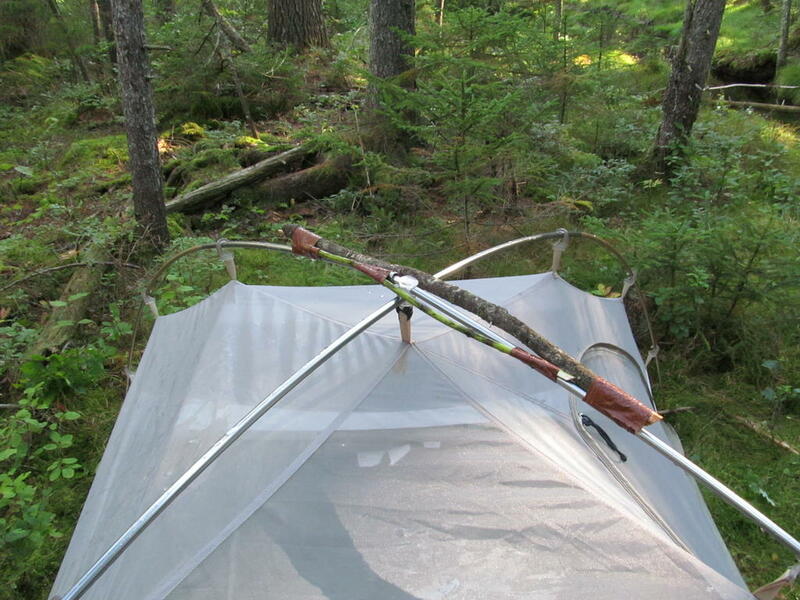 Now I have the tents pitched in the back yard to dry the bog off of them. With any luck, I’ll be able to take them down tomorrow, and consider repair strategies for the broken one. It snowed a little today. We got about zero inches. I noticed the flakes out the attic window. Yup – I was up there installing more insulation. I am now well past the half done mark, but that includes the work I did two years ago too. I’m pretty sure I will finish it (or come very close to finishing it) before my holiday break ends. 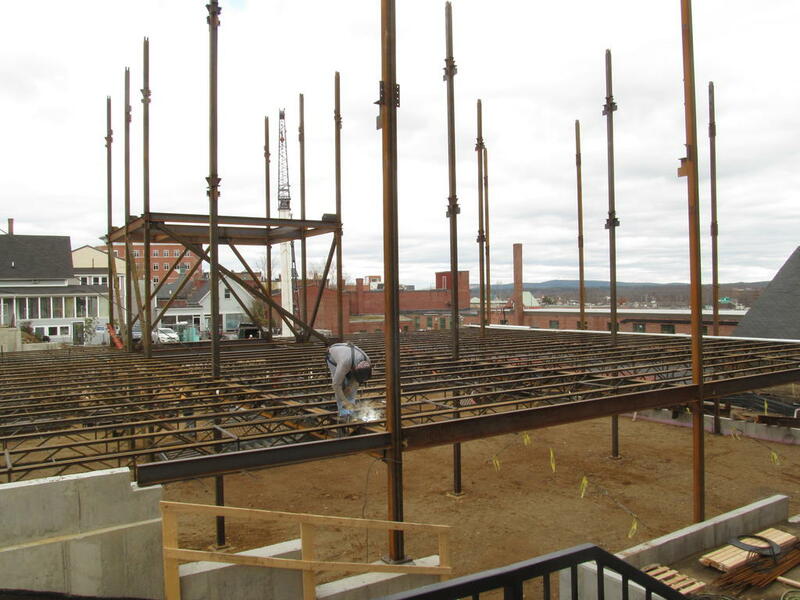 When I had about all the insulating I could take in one dose, I headed down the stairs. Poor Penny had not been taken outside for exercise all day. David has been sick with a sinus infection, and Va was in town running errands. So I grabbed my camera and took her down to Sandogardy Pond. 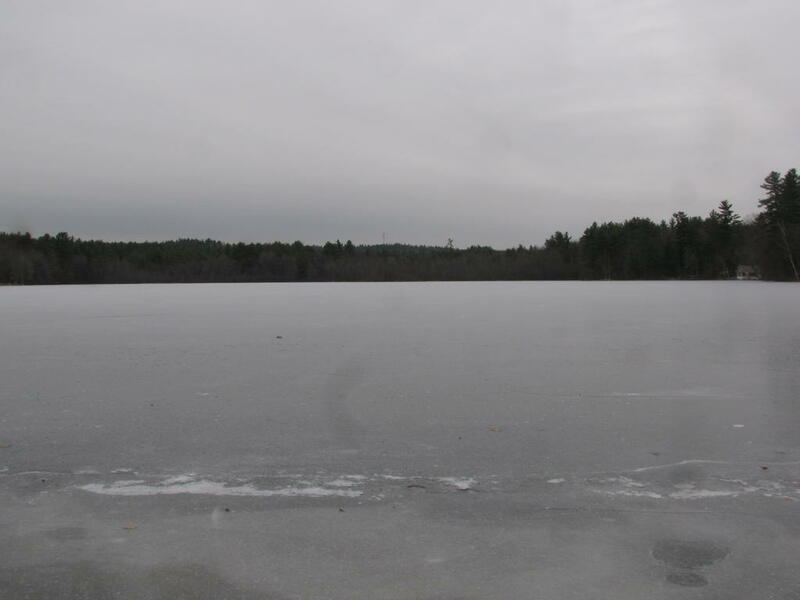 It has frozen over now, but I don’t think the ice is safe yet. I did go out on it, but if I had fallen through, it would not have been deep enough to wet my knees. It was plenty slick though. The puddles in my driveway are frozen now too, so it’s almost like it’s paved now. In places. Penny and I headed down the trail that parallels Little Kohas Creek. Penny does not like the bridge that crosses the creek, but the last time we were down there, she crossed it anyhow. She thought about wading across, but I told her not to. Then she tried the other side, and again I told her not to. Then I told her to sit. I was not going to go very far. I was looking to see where Kohas might have built his cabin (no luck there). But Penny could not stand it. She carefully treaded over the bridge with much trepidation. Of course that meant she would have to cross it again, but on the return trip, she went over without hesitation (but still with plenty of trepidation). Today she toddled right over. I still have no idea where Kohas’s cabin was, but I am planning to plant a geocache along the creek in his honor. I found a place to hide it last time I was there, but then got to thinking about the snow. When it comes, it will make the cache inaccessible. It’s better to hide them higher up so they are accessible year-round. But it’s also harder to find a hiding place up off the ground. I thought I had found a spot, but now that I think about it, it might not be above the creek’s high water line. Or maybe it is. 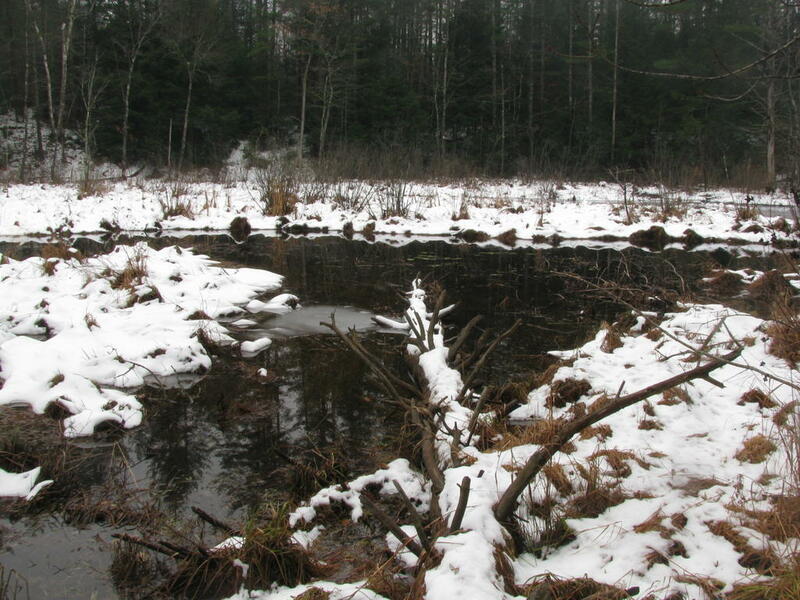 The pond regulates the creeks depth pretty well. 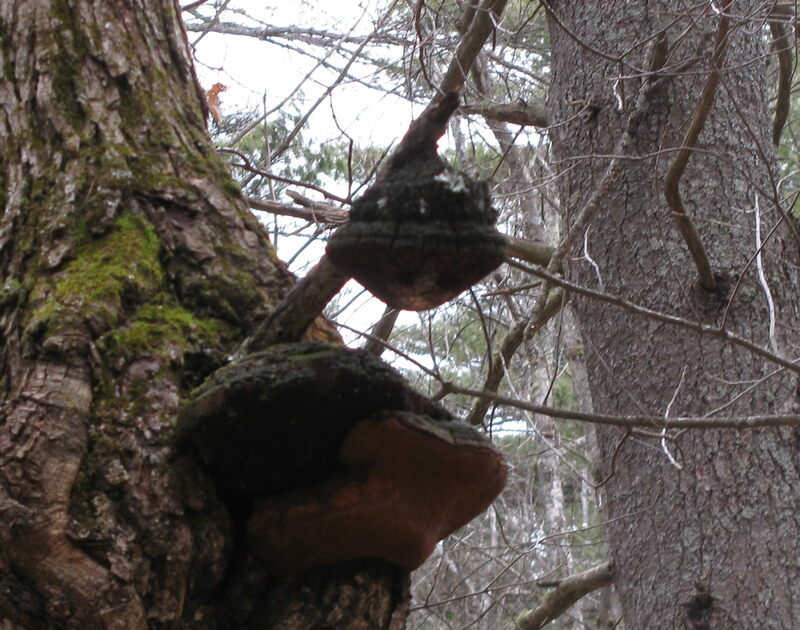 While I was out looking for a place to hide my cache, I spotted a strange fungal formation in a tree. 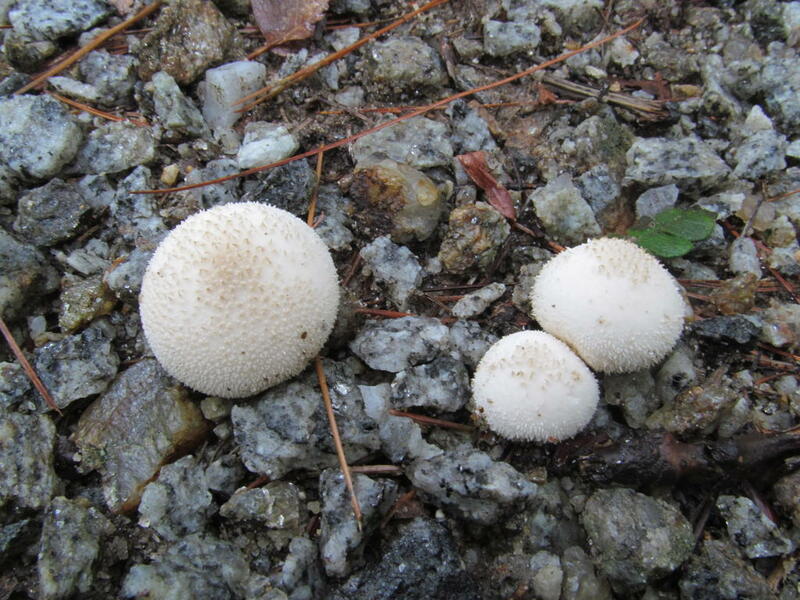 There are two growths there. A very large one on the trunk, and a smaller (but still large) one growing on a dead branch. It looks a little like the lid to a teapot to me. But back to the cache. I ordered some plastic toys which are models of some Powhatan Indians. Kohas was probably a Pennacook Indian, not Powhatan, but the Powhatans were the only eastern tribe I could find on the Innernets. Most are Plains Indians (and come with cowboys). When my Powhatan come in, they will go in a Lock-n-Lock container along with the cache log, a pencil, and maybe a little more swag. I will eventually find a place to hide it. I am also going to hide a cache near the Northfield Union Church. That church was built in the late 1800’s and given to the city of Northfield so that any denomination that wanted to use it could, and free of charge. The first four to do so were the Methodists, Congregationalists, Freewill Baptists, and Adventists. Each one of these denominations has an organizational logo, so I am looking for lapel pins depicting them to go in the cache as trade items. The Adventists who met there were probably not Seventh-day Adventists (because there is no mention of anyone meeting there on Saturdays), but I am going to go with an SDA pin, because that is my own denomination, and I have a dozen SDA pins already (mostly from Pathfinders). For the Freewill Baptists, I may have to go with a more generic Baptist pin. I plan to check out a local Christian book store to see if they have anything like what I want, and if not, I will turn to the Internet again. Keychains would work just as well as pins. When Penny and I got home again, I was pretty tired. I sat down for a few minutes and then broke out the vacuum cleaner and ran a load of dishes. Va was in town running errands. By the time she got home, I was snoozing on the couch. She made a nice pot of chili and a batch of cornbread, and that revived me again. I’ve not been able to get out and do much photography of late, as it gets dark here a little after 4:00pm now. Actually, I believe tonight is the earliest sunset of the year. I find it odd that the earliest sunset is not on the winter solstice, but is most certainly is not – it comes about a week before. The latest sunrise comes about a week after the solstice. The solstice is the shortest day of the year, so it sits halfway in between. But that was a tangent! Since there hasn’t been much in the way of light when I have time to take pictures, I don’t have many. So I decided to see what pictures I took, liked, but didn’t share yet. We’ll have to go back to Thanksgiving weekend for that. I took a walk with Penny down to Sandogardy Pond, and made a side trip into the town forest, past the sandpit, and to the area where Beth and I have hidden a geocache. This is some of what I managed to capture during that walk. 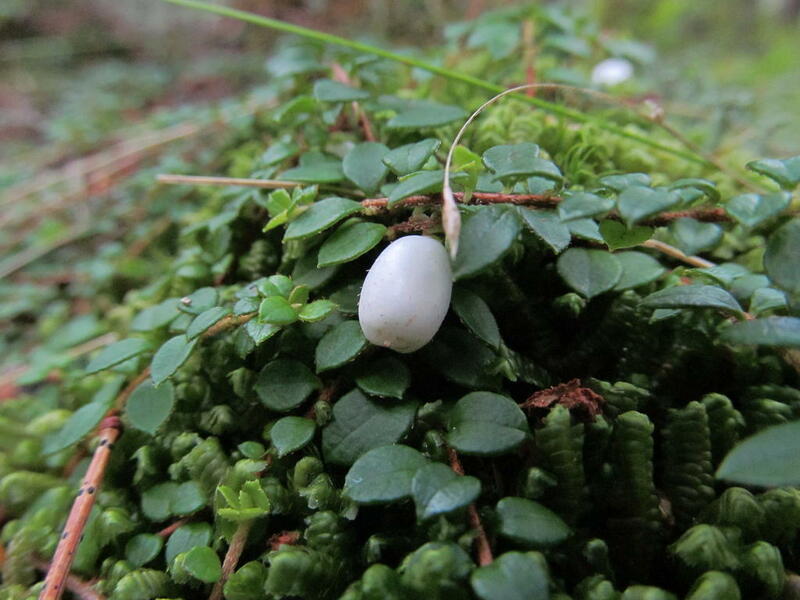 This is a Canada Mayflower (Maianthemum canadense) poking its berries out of the snow (which is now long gone). It’s an early bloomer, and the fruit stays on for quite a while. 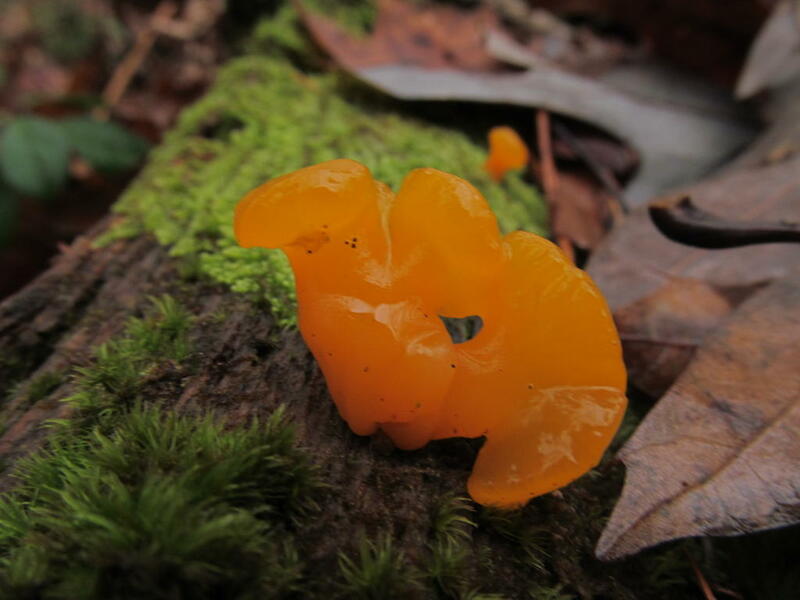 I believe this fungus is witches’ butter (Tremella mesenterica). 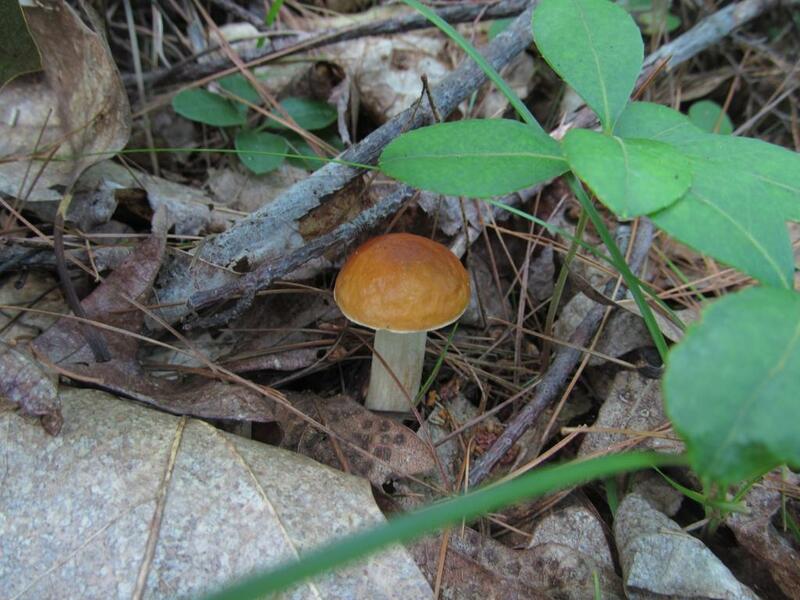 According to Wikipedia, it is edible, but “bland and tasteless.” That hardly seems worth risking mushroom poisoning over. I prefer to feast on it with my eyes. I don’t know what kind of shrub this is. My intention was to try to find out when I got home, but that didn’t happen (yet). It will be a lot easier to id if I wait until spring when it puts out leaves and flowers. I’ll check back then. This spot is pretty close to our geocache. The stream is wide and meandering at this point, and I’m pretty sure it’s shallow enough to wade across at about any point. But I sure think it’s pretty. I tarried here for a while and threw lots of sticks for Penny. She doesn’t seem to care much about scenery, except the extent to which it provides her with sticks. The stream drains Sandogardy Pond and flows down into the Merrimack less than a mile from here. It’s name today is Cross Brook, but it had been called Little Cohas, Pipers, and Phillips as well. I prefer the oldest of these names, “Little Cohas Brook.” Little Cohas was the name of an Indian who had a cabin along the creek and used to hunt and fish around Sandogardy Pond in the 1750’s. I’d love to find the exact site of his cabin, but I think that is probably beyond my skill.